The makers of the new mobile game Bit City have already tweaked one of their game’s microtransactions, just days after launch. I guess I wasn’t the only one who thought it was messed up, even by microtransaction standards. The game in question is called Bit City. It’s a cross between Sim City and clicker games like Cookie Clicker. You manage a city, mostly by tapping around on your screen. It’s fun enough, though it’s light on strategy, and I’ve been having a good time with it during my recent new-kid-driven embrace of phone games. 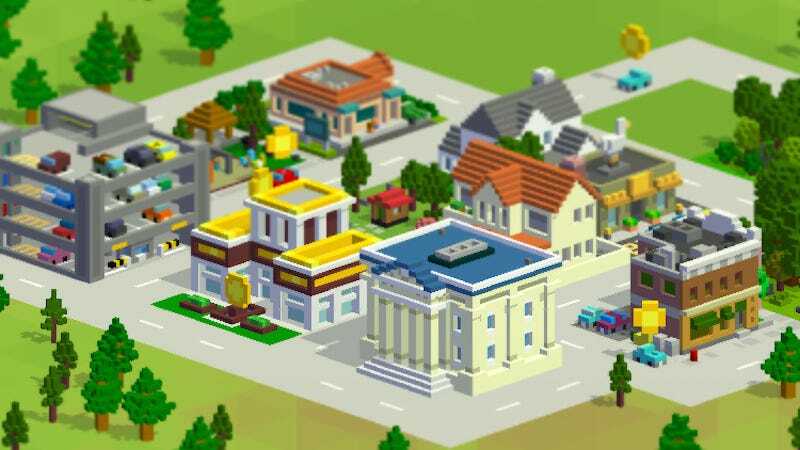 As with most clicker games, you spend a lot of time in Bit City watching numbers tick up, earning more in-game cash so that you can develop more buildings so that you get more tax revenue so you can build more stuff to in turn get more revenue. It’s an addictive loop. The game has a micro-transaction involving a “Pension Pig” that costs $2.99 and seems to be designed to mess with your mind. For that low, low price you can crack open a piggy bank and get the “bux” inside it. You want this, because “bux” allow you to permanently set stat-boosting policies for your cities and can buy you any one of an elite set of buildings that make your city thrive. You can earn bux by playing, mostly by completing in-game challenges or tapping on cars in the city streets that sometimes generate bux on their roofs. But cracking that piggy bank would also be a great way to get bux. The number of bux in the Pension Pig increases the more you perform meaningful in-game actions like upgrading your city. You get all the Bux in the pig when you crack it, but then you have to pay $2.99 again the next time the bux build up in the pig and you want to crack it again. So. From the moment you learn about the Pension Pig, the question becomes: how long will you play Bit City and add bux to that pig before you’ll pay $3 to access them? That’s the mind-game. Really, how badly and how quickly do I want to earn the 1,250 bux needed to build mini golf courses in my city? Hell, how badly do I need the 274 needed to start unlocking the “Smart Grid” perk to increase each building’s payout? Or the 78 needed to increase “bank savings time”? I really want more bux! I feel like I got burned by the Pension Pig. I paid $2.99 to open it pretty early on as a way to give money to the developers who made Bit City. It was only later that I realized I would’ve gotten more bux for my bucks if I’d just waited. I got very little for my money because hadn’t realized that if I ever wanted to access the pig again, I’d have to pay $2.99 again. Most microtransactions in free-to-play games like Bit City are psychological tests. You’ve downloaded the game and now are playing the meta-game of seeing how much you can enjoy it without paying for anything. Like me, you might be okay paying a microtransaction here or there to pay the developers for their work, but the microtransaction systems usually involve testing how much you value your time versus your money. Will you wait and play a game like Bit City to slowly earn bux by completing quests? Or will you buckle and just crack that pig? The Bit City Pension Pig is a particularly devious setup not just because it’s constantly testing whether you’ve decided it’s worth it to pay, but because it’s almost always a bad deal. Check out the in-game store and it’s plain as day. Why would I pay $2.99 to get the 422 bux I’ve accrued in the pig after a couple of half-hour sessions of play when I could just pay $5 to get 3,500? Of course, it doesn’t stop there. Why pay $5 for 3,500 when $10 will net $10,000? And so on. Of course the Pension Pig could be the most lucrative option of all if only it had a few thousand more bux in it, but it’ll only have a few thousand more bux in it if I keep playing the game. And the longer I play the game, the longer I’ll wonder if I should just buckle and go for the more straightforward $5 or $10 transactions instead. And then there’s the additional wrinkle that you can pay for the pig again and again. So if you give in too soon this time, well, maybe you’ll be able to hold out longer and let the pig fatten more before paying the $3 next time. The more I play, the more the Pension Pig gets me thinking less like a gamer and more like a gambler. It says quite clearly, “Pay each time opened,” as opposed to just “resets when opened,” which is what it used to say. It’s still a mind game, but at least they’re being clearer about it.